An exact foundation-date of the company Rumpf in Cologne is no longer known today and can also be understood no longer. The origins lie after information of still living ancestors in the time of the emperor-empire during the I. World war about 1916 to 1917. The construction material - and carbonic-action obviously existing at that time was adopted with a small associated building contractor in Cologne of Mr. Christian Rumpf - probably in the post-war-years 1920 or 1921 of the grandfather of the Mr. Rudolf August Christian Rumpf. Mr. Christian Rumpf, cigars - and tobacconists from Kassel, born in June 1883, married in Cologne Miss Wanda Kornek, born in Aachen. Their brother, Hans Kornek drove a tax-chancellery in Bonn. The wife of this tax adviser Kornek, a half-Jewess, with names Beate Machowitz from Cologne should come as daughter from this construction material - and carbonic-deal of that time. Mr. Christian Rumpf had a road accident beginning of the 30`er years, became a go hindrance heavily and could only run with a corsage. His wife Wanda continued the business with your nephew, the mason-master Günter Wagner from Limburg. Son Fritz Rumpf became on pushes his parents - 1942 heavy-war-damaged from the military hospital releases - and came back into the business. In the following years, the company now one leded from a woman and three men from which two were not fully operational, continued and - surely more badly than argues - through the war - and post war confused escorts. During the post war - and construction-phase of the BRD as consequence of the II. World war from approximately 1946 to 1960 the business had up to over 120 workers. Main-clients in this time were the city Cologne and the former Federal-mail. Son Fritz Rumpf could set aside 1947 the masters exam with 32 years. 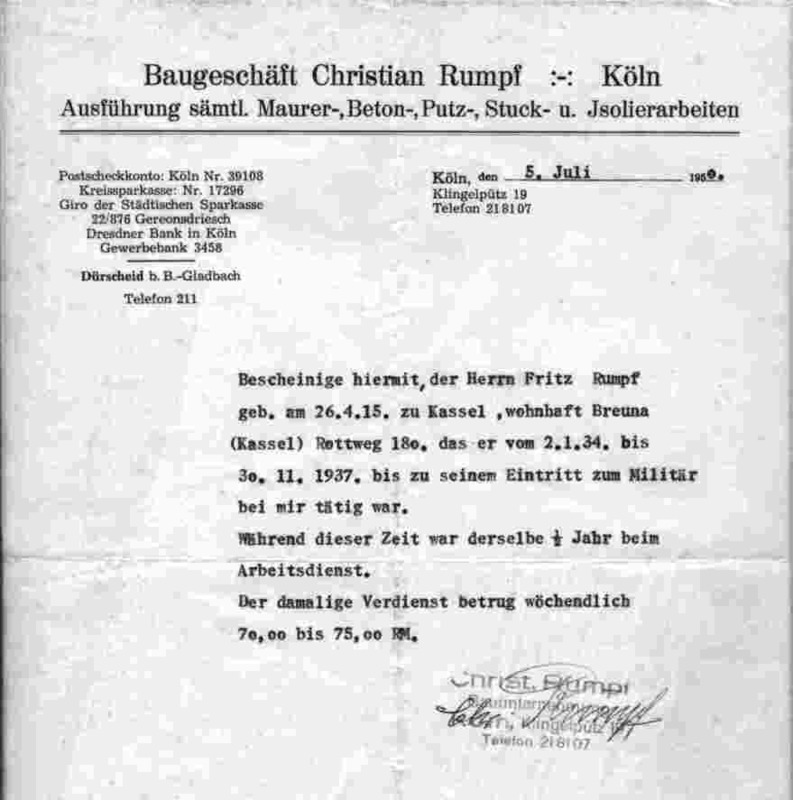 Copy a certificate of employment from the year 1950 of the father Christian for the son Fritz for the years 1934 until 1937 to the presentation at the Rhein-province and the annuity insurance-institution in Düsseldorf to the birth of his son - Rudolf August Christian Rumpf. The original-records to the pensions - and social insurance were burned with the bombardments of the cities Cologne and Düsseldorf and had to - generally like possibly - is replaced. Shortly after the border-opening to the " east of Europe " in the year 1989, Mr. Rumpf collected - in a type construction-help east - further vocational foreign-experiences in Poland and Turkey. 1998, Mr. Rumpf went to Sicily and tries was described to move his vocational knowledge and experiences into an activity just like it from Archimedes with buoyancy since then. This activity can and must correspond to of course only the temper and the mentality of a southerner, that is; we moves universe - however can happen nothing. Mr. Bruckmaier continues the office in Landshut since 1996. Mr. Rumpf lives a part of the year itself in Sicily and takes care of prospects, customers, investors, the EC-office as well as the regional - and province-governments there on the spot. Daughter Stefanie studies the Bauwesen and would like to continue the expert-activity of her father after corresponding qualifications.